Major millions adopts a military like theme, but it cannot be described as militaristic. The military theme is evident due to the presence of an army Major, a battle tank, a war plane, a battleship, rank medals, an ammunition box, a classified letter, field binoculars and a Major’s hat. The military paraphernalia is not necessarily mean looking. The military symbols in use all look playful and rather soft. For example, the warplane has a bewildering smile and drops gold coins instead of lethal bombs; the battlefield tank is manned by a flummoxed-looking soldier and instead of it shooting bombs, it shoots flags. The military theme is fused with a money theme, and it is evident from the sound effects. During the military band tune, you will hear the unmistakable sound of a cash register. The warplane also drops coins instead of WMDs. The five-reel slot was introduced to online casinos in the year 2004 by Microgaming. Microgaming is the undisputed king of online casinos. It is well known for developing popular games and providing online casino platforms that are all rounded. Major Millions is included in the lucrative Microgaming Networked Progressive jackpot which includes slots like Mega Moolah that is known to offer generous payouts to players running into millions of dollars. 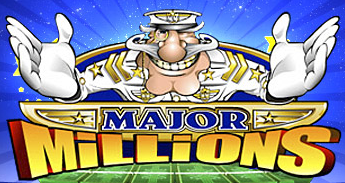 Major Millions is a straightforward five-reel slot with no free spin or bonus rounds. Surprised? The slot has five pay lines with a defined coin size of $0.20. You can only use one coin, but you are allowed to bet on as many pay lines as you please. Your wager can be anything between $0.20 and $3.00. All the wins in Major Millions pay from left to right. Major Millions Progressive symbol plays wild and can replace all other symbols. On its own, the wild acts as a multiplier of any winnings. Landing the 5x wild on the 15th pay line rewards you with unlimited progressive jackpot. If you land the same 5x wild on the 1st to 14th pay lines pays 8,000 coins. Most players are perhaps attracted to this game due to its generous progressive jackpot. While the jackpot is not a daily occurrence, it is on average won every seven months. The minimum you can win in this progressive jackpot is $250,000. The jackpot grows as the game is played in casinos everywhere. The jackpot gets its money from a fraction of every losing bet. On average, the progressive jackpot is $400,000 - $500,000, though the recent jackpot payouts were over $1.7 million and $1.8 million in February 2012 and May 2012 respectively. The progressive jackpot is activated by aligning five wild symbols on the 15th pay lines, and you are required to play the maximum bet coins and pay lines in order to hit the jackpot. Major Millions is a fun to play both for newbies and pro players. Although this game doesn’t have free spin features and bonus rounds, this game has a history of significant wins, and you will want to be part of a winning team.